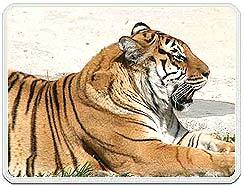 Tiger is not only the National Animal of India, it is the very essence of Indian wildlife. But poaching and too much killing have threatened its very existence of this magnificent animal, Tiger. Tigers are the largest living members of the cat family and commonly weigh up to 500-600 pounds and reach a length of 9-10 feet, excluding the tail. The outer look of the tiger usually has reddish yellow or reddish brown coat with black stripes, ventrally it is white giving it a royal look. Its ears are black on the outside and each of them has a prominent white spot on it. 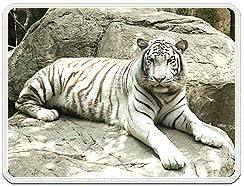 On rare occasions, Indian tigers are born with pure white fur and black stripes. Indian tigers have different colored eyes ranging from blue to the usual brown. Despite their fearsome reputation, most tigers avoid humans; however, a few do become dangerous maneaters. These animals are often sick and unable to hunt normally, or living in an area where their traditional prey has vanished. Indian Tigers are very rugged and can survive in a variety of environmental situations, ranging from dry and arid to high-altitude, cold and Himalayan regions. In India, the animal is found in the mangrove forest of Sunderbans, the wet and evergreen northeast India, the hot and arid jungles of Rajasthan and the swampy reedlands of the Terai. Tigers hunt on their own and usually lead a solitary existence, each in its own territory. It is also the largest land-living mammal whose diet consists entirely of meat. As per the food chain cycle, tiger can eat a variety of animals such as deer, antelopes, gaurs and wild pigs, sometimes it also captures birds, lizards, turtles, fishes, frogs and crabs, but no one can have tiger as their food. Tiger can preserve their prey for next meal by covering it with leaves and grass. Tiger's agile and lithesome body helps in hunting at an amazing rate. They are endowed with good swimming power but seldom climb trees. 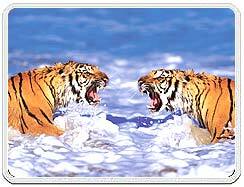 Each tiger selects his own territory according to the power he possesses. Male tiger has a larger dominion than a female tiger and the area of female tiger is usually within the range of male tiger. The primary resource of this territory is food. A female's territory must contain enough prey to support herself and her cubs. In their natural environment, Tigers usually live up to 15 years.If they are kept in a secured environment like zoo, then they can live around 20 years. A male and female tiger meets only briefly. Their is no such reproduction period or season for tigers, mating can occur at any time, but the most preferred season is autumn and winter i.e., between November and April. Once the mating process is over, there is no meeting between the male and female tiger. The gestation period usually lasts for three and a half months. The female tiger gives birth to two to three cubs in a secluded place like thick bush, cave etc. It is the responsibility of the female tiger to nurse the cubs until they are on their own. A cub takes around six months to grow and the next 18 months become independent. The chance of the survival of cubs depends upon the fulfillment of the basic necessities such as food and other habitat requirements. Female cubs, when fully grown may establish a territory adjacent to that of their mother, or even take over part of their mother's territory. Adult females generally produce a litter every two years. Shoulder height : 36 in. Sexual maturity : 3-4 years. Mating : Usually in spring. Litter size : 2-4 cubs. Habit : Solitary and nocturnal. Diet : Consists of pigs, deer, antelopes and buffalo, Chital, wild boar, monkeys, gaur, buffalo. Call : Roar, growl, or purr. Lifespan : 15 years under normal conditions. 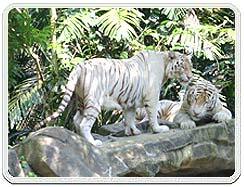 Bengal Tiger attracts tourists from all over the world. Bengal Tiger is the largest in the cat family. The skin of these Tigers have black stripes which gives it a royal look. These Tigers generally found in White. The scientific name of the Tiger is Panthera Tigris. Bengal Tiger is the guardian of the jungle. He can protect, he can guard, and he can kill if he finds someone breaking the laws of the jungle. The Bengal tiger is perceived as an icon of strength, speed and agility from Siberia to Sumatra. 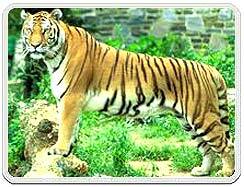 The Royal Bengal Tiger lives in varied habitats open jungles, humid evergreen forests and mango grove swamps. 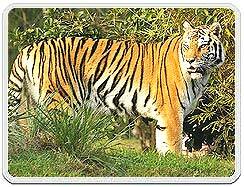 In India, Bengal Tiger is found in the mangrove forest of Sunderbans. Sunderbans are the Major Indian Tiger Hub. In Sunderbans, the animal still enjoys reverence, where according to an estimate though about half of the tiger population has mauled humans. Royal Bengal Tigers hunt on their own and usually lead a solitary existence, each in its own territory. 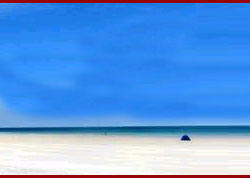 They are also found in other areas of India as well as some parts of Nepal and Burma. There were at least 50,000 Bengal tigers in India alone in the 19th century, according to an estimate. We had over forty thousand tigers in the beginning of the 20th century, but the number has decreased considerably. For example, the authorities of the Buxa Tiger Reserve in North Bengal estimated the number of Royal Bengal tigers in the reserved areas as 32, as per the census in 1997, a notch above the figure of 31, as per the 1995 census. It's estimated that less than 3,000 Bengal tigers are left in the wild today. Tiger once the symbol of Indian wilderness, and shooting (of course with guns from quite a safe distance) them was taken to be a symbol of heroism. Over a few centuries, the tiger was mercilessly slaughtered by all trying to prove their manhood. Documents show that more than 20,000 tigers were shot between 1860-1960. The actual figures no doubt would be much more than this. But before it was too late, the government under pressure from biologists and tiger lovers from all over the world pressed the panic button and Project Tiger was launched in India. After the resounding success of the Tiger Conservation Program in India known as Project Tiger, the population of wild Tigers has increased dramatically. The Bengal Tiger is now strictly protected, and is the national animal of both Bangladesh and India. The Tiger population of India has reached about 3,500, up from 1,200 in the 1970s. In the Sundarbans, a 2004 census found the presence of about 280 Tigers on the Bangladesh side. But from the late 80's and the early 90's the Tiger population has suffered a setback due to Habitat destruction and the large scale poaching of these animals for their skins and bones. Approximate worldwide population of 4,580 Bengal Tigers is estimated in 2005. Now in 2007 there is an estimate of a small drop in China (due to the increase of zoo-bred Chinese Tigers), 10 more in Bhutan, and a major increase of almost 50 total in the wild. The roar of a Bengal tiger can be heard 2 miles away. A tiger is a voracious eater. It can kill the equivalent of 30 buffaloes a year, and eat 65 pounds of meat in a night. After killing its prey, the tiger always starts feeding from the hindquarters first. Tigers, unlike many other cats, often eat meat that has begun to putrefy. The Siberian tiger, a cousin of the Bengal tiger, is the world's largest cat. To protect the Royal Bengal Tigers, Project Tiger is a wildlife conservation project initiated in India in 1972. It was launched on April 1, 1973 and has become one of the most successful conservation ventures in modern history. The project aims at tiger conservation in specially constituted 'tiger reserves' which are representative of various bio-geographical regions falling within India. This project entailed the creation of nine tiger reserves, now this number has increased. The management strategy of Project Tiger was to identify the limiting factors and to mitigate them by suitable management. The damages done to the habitat were to be rectified so as to facilitate the recovery of eco-system to the maximum possible extent. The overall administration of the project is monitored by a 'Steering Committee'. The execution of the project is done by the respective State Governments. A 'Field Director' is appointed for each reserve, who is assisted by the field and technical personnel. The Chief Wildlife warden in various States are responsible for the field execution. At the Centre, a full-fledged 'Director' of the project coordinates the work for the country.